GCA Club Appreciation Award: Jennifer Langston "for her creativity and superlative knowledge of our Club and willingness to always contribute beyond when called upon." SLGC President's Appreciation Award: Karen Colini "for consistently and tirelessly providing valued expertise and a cheerful willingness to pitch in for myriad Shaker Lakes Garden Club activities, from both a leadership and 'boots on the ground' perspective." 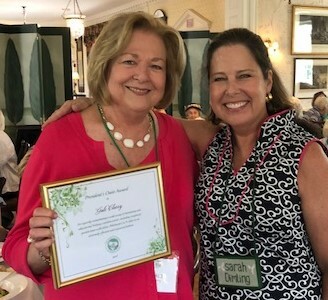 SLGC President's Oasis Award: Gale Clarry "for expertly orchestrating a wide array of interesting and educational Visiting Gardens events, including reciprocal garden tours with fellow Pittsburgh GCA clubs in an extremely efficient and organized fashion." We were honored to have Clara Rankin at our meeting and applaud her for her 72 years in SLGC. Sarah presented her with a special hat.